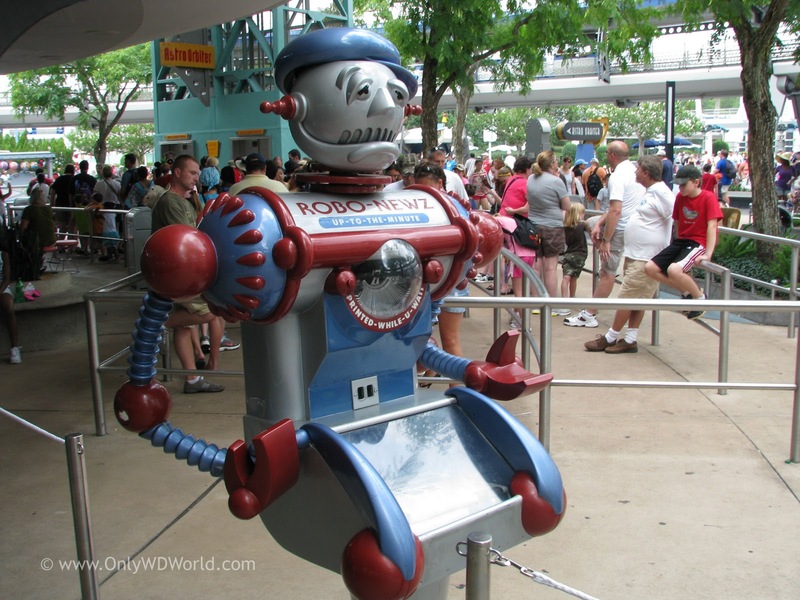 Disney World Guests can discover the Robo-Newz when they visit Tomorrowland in the Magic Kingdom. 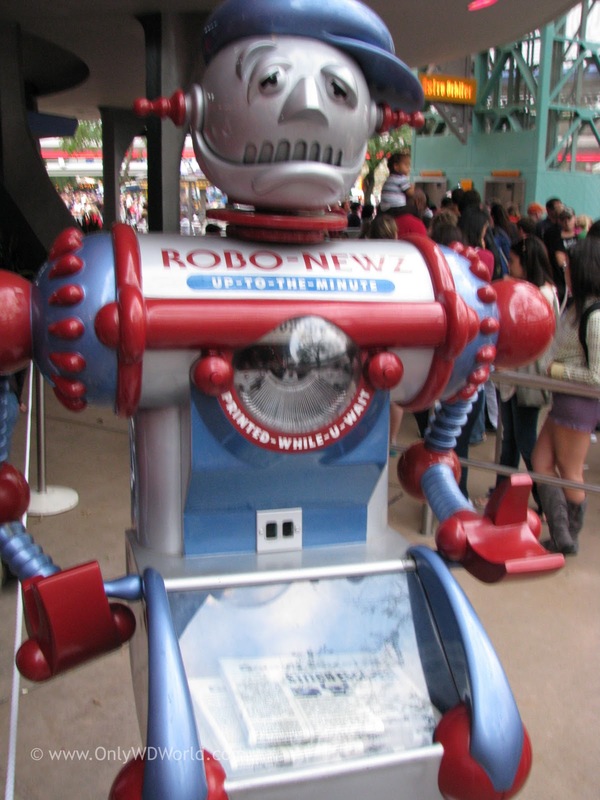 As part of "The Future That Never Was" the Robo-Newz is a robot that claims to have the news "Up To The Minute" & "Printed While U Wait." This Robo-News vendor can be found by the entrance to the TTA Peoplemover. A closer inspection can reveal the front page news on the latest issue of the Galaxy Gazette. The lead article details the mis-adventures of Galactic Federation Transport Center when Experiment 626 crosses their path. You also learn that at the time of the article he is still at large somewhere on Earth. This is a great example of a detail dreamed up by the Disney Imagineers that enhances the experience and further connects the story of Tomorrowland. 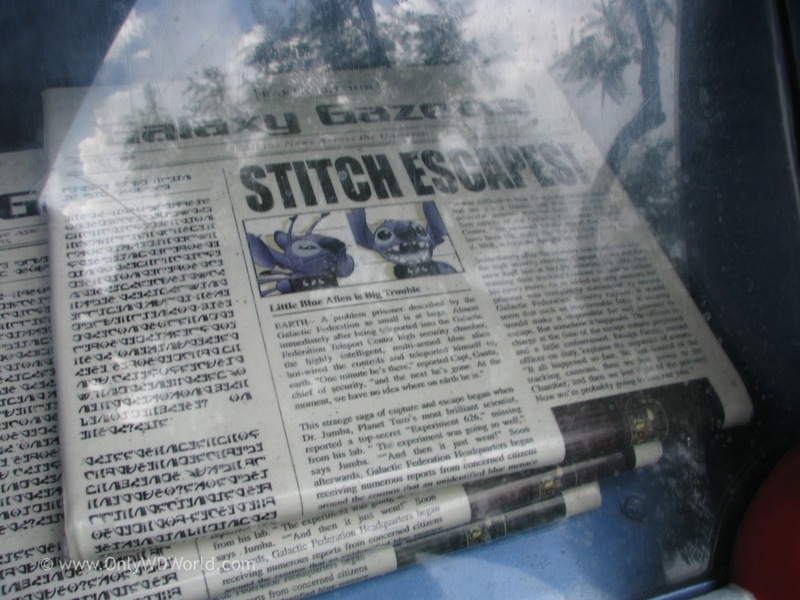 If you enlarge the photo of the newspaper you can read most of the article detailing the adventures with Stitch that gives the reader background on what they might experience at Stitch's Great Escape. Taking the time to investigate these little details that are separate from the Disney World Attractions can really enhance your experience. 2 comments to "Robo-Newz Direct From Tomorrowland"
I was part of the design team that fabricated and installed the Robo-Newz robot and few other robots in Tommorrowland in the late 90s. We built them from napkin sketches provided by WDI. It was a great project.